Organizing is dully covered on the HTC One. Office documents are handled through the preloaded Polaris Office app. It supports Excel, Word, PowerPoint and more and lets you view and edit files on the go. We tested a couple of Word and Excel files and found the One perfectly capable of handling them. 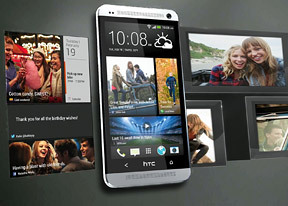 The calendar on the HTC One has been redesigned in accordance to the new Sense 5 look. For one days aren't highlighted in a hand-drawn circle but regularly instead. Instead of the selectable tabs now the Calendar lets you side-swipe between tabs (just like in the People app). It has four different types of view: daily, monthly, agenda and invitation. Adding a new event is quite straightforward and you can also set an alarm to serve as a reminder. Naturally, the Calendar supports multiple online calendars (including Facebook), only one of which you can sync with your computer. You can also easily show/hide the ones you don't want.